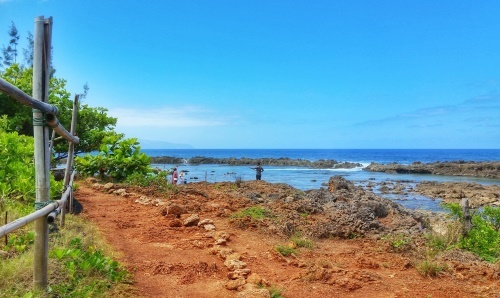 Shark’s Cove can make a good starting point for your North Shore adventures on Oahu, whether it’s winter or summer. If you make a trip to the area, you’ll likely want to have a list of beaches to make a part of your North Shore tour! 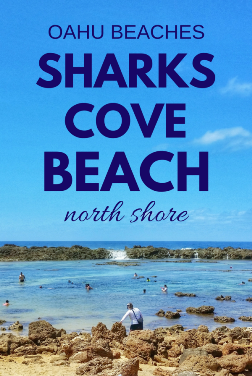 The North Shore is known for its high surf during the winter months at beaches like Waimea Bay, and although Shark’s Cove is an enclosed lagoon, this can impact the waters of Shark’s Cove because the waves can be that strong. So be sure to use your wisdom! Sometimes it can be obvious, other times it may not be so obvious. 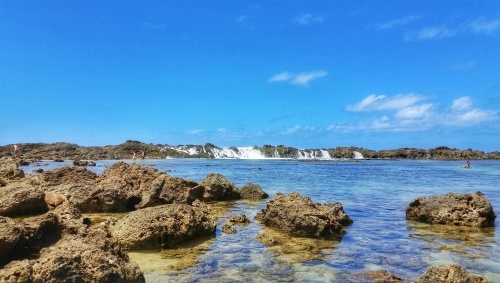 This can be an ideal spot to start your North Shore beach adventures, because in addition to the snorkeling, there is a place to rent snorkeling gear and stop for a snack (or meal!) 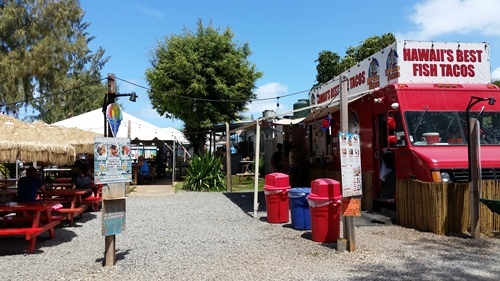 at some North Shore food trucks. There’s a hike nearby too. The North Shore is about an hour’s drive from Waikiki. Because Oahu has a bus system that circles the island, it is possible to reach the North Shore by bus, but it will take extra time. Also consider that the bus in the North Shore usually comes around once an hour, so you’ll also want to plan your time well if you’re taking the bus from Waikiki to the North Shore. Google Maps public transit directions are pretty reliable for planning out your activities on Oahu by bus. Here’s the quick list of what’s covered on this page! The beach here is rocky because of the lava rock that makes up the shoreline. This is one of the beaches that makes it a good idea to have these types of shoes that makes it easy for you to walk between the beach and getting in the water without worry of getting a cut from one of the sharp rocks hiding under the sand. 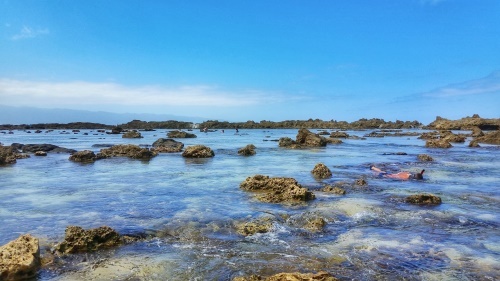 The lava rocks are also what protects this cove from powerful ocean waves, providing the ideal snorkeling conditions. Once you’re in the water snorkeling, you have a good chance of seeing marine life as well as the underwater rock formations. Okay, so these may not be officially called waterfalls, but if you like waterfalls, you can see a kind of ocean waterfalls on the North Shore at Shark’s Cove! The strong North Shore waves come crashing over the barrier of the lagoon to create ocean waterfalls! There’s a spot located conveniently across the street from Shark’s Cove that you can rent snorkeling gear. Of course, you could also put snorkeling gear on your Hawaii packing list and bring it from home! One of your considerations in renting snorkeling gear on Oahu or bringing it from home is the cost of snorkel rental. These are the prices from spring 2017 of the shop located across from Shark’s Cove. 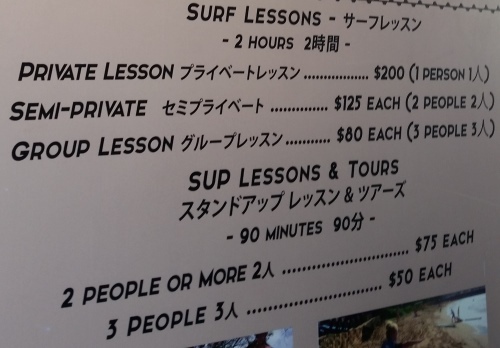 While the rental prices listed on this page are for one shop, you can expect comparable prices at other North Shore surf shops to give you an idea! You’ll want to think about how often you’ll be snorkeling to decide whether or not you want to buy a snorkeling set with snorkel, mask, and fins before you arrive to Oahu, or rent when you arrive! When it comes to packing snorkeling gear in your suitcase, the fins are what takes up the most space. That’s one reason why you’ll be able to rent fins separately. So you may also consider buying a snorkeling set with just the mask and snorkel before your trip to Hawaii, and then rent fins when you get to Oahu. A full-face snorkeling mask like this is another beginner-friendly option. Hanauma Bay is another popular snorkeling destination on Oahu that’s on the other side of the island, and you can also rent snorkeling gear there too. 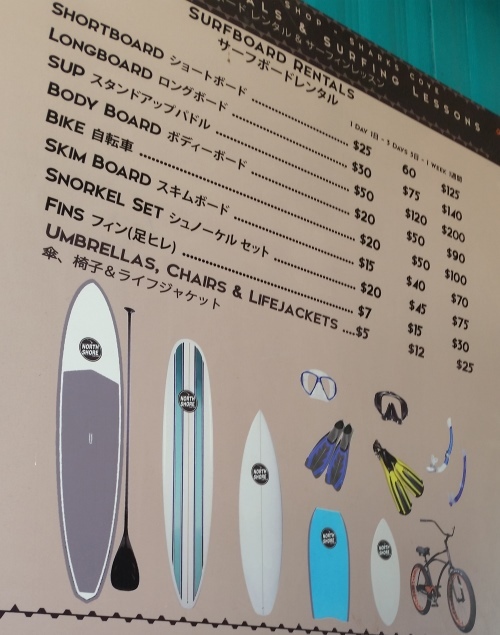 Here are prices for snorkel gear rental at Hanauma Bay. Being that the North Shore is known for its waves during the winter, you can also rent some surfboards, along with other gear for your beach and outdoor adventures at different North Shore beaches. Similar to the snorkeling gear, there is a discounted rate for a weekly rental and for 5 days. In the picture below, the columns show prices for daily, 5 days, weekly. 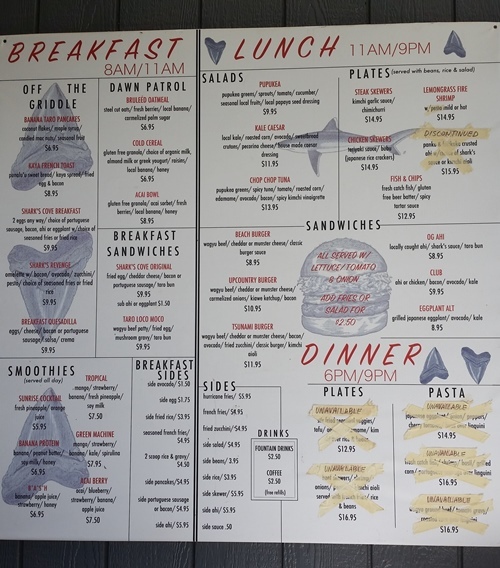 There are a few different trucks here that you can order food from, and here’s a sample menu from one of the food trucks! Click here to zoom in to the image. If you arrive to the North Shore by bus, when you get off at the bus stop that’s just north of Shark’s Cove, you can take the small trail along the water to get there. There are places you can climb over the rocks too if you’d want to do that because of the rocky nature of the area. Just down the street from Shark’s Cove is the North Shore’s pillbox hike. This will likely take you about an hour to complete. It can be the perfect hike to add to your North Shore itinerary, because following your workout you can cool down with some quality snorkeling time! And the best part is the amazing views of some North Shore beaches that you will get! You’ll get the best views of Sunset Beach. There’s a heiau on the North Shore called the Puu O Mahuka Heiau. This is a former place of worship for Hawaiians. 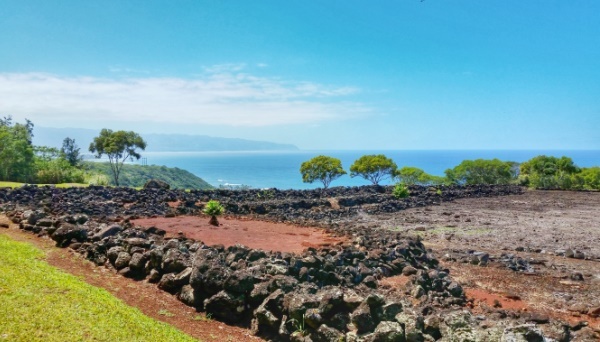 It’s known as the largest heiau on Oahu, and it’s located right by Shark’s Cove. You’ll drive up a road to get there, which means that when you reach the temple grounds, you’ll get sweeping views overlooking the North Shore coast. So this is another activity that you’ll get a chance to see some amazing views of North Shore beaches. There’s a short trail that loops around for you to hike. If you are passing by Shark’s Cove, it is definitely worth a stop! 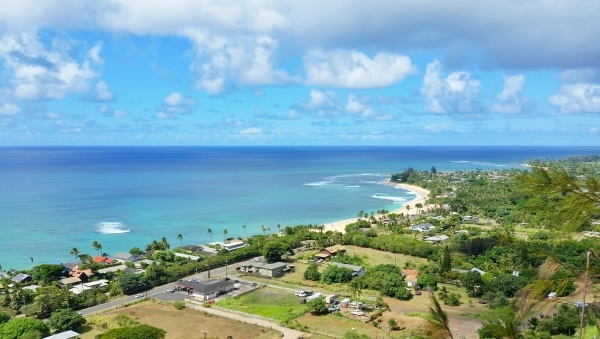 You’ll get the best views of Waimea Bay that exist on Oahu… views from above! Things you may want to consider packing for your Shark’s Cove snorkeling trip! 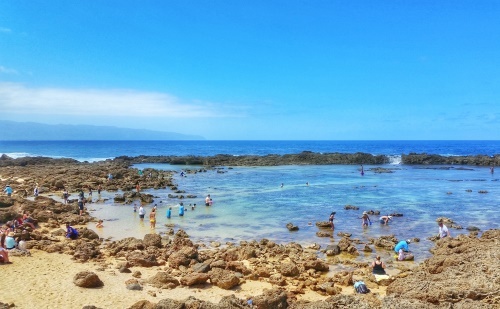 Now, here are some things that you may want to add to your Hawaii packing list for snorkeling at Shark’s Cove! This type of pouch so you can take your valuables with you in the water! These types of UV protection shirts to wear so you don’t burn under the strong tropical sun rays when you’re in the water! If you’re on a computer, use the far left column to filter by women, men, girls, or boys! Look at these types of swim shorts too, for women and men! These types of beach shoes so you can protect your feet from sharp rocks hidden under the sand! This type of beach bag that’s open air to start the drying of your beach gear after you’re done snorkeling to get ready for the next beach day! For a more in-depth look at what to bring snorkeling at Shark’s Cove, have a look at what to wear snorkeling!